Work with Locust House Fine Stationery to create wedding invitations that will enchant your guests and build anticipation for your event. As a child, Kristy's great-grandmother had a drawer filled with greeting cards that she kept on hand for every occasion. On each visit, Kristy would spend hours looking through the drawer, carefully selecting the perfect card for each family member and friend. Nothing made her happier than sending a loved one a beautiful piece of mail that would put a smile on their face. Today, it is her sincerest hope to create the perfect mail for you. An invitation that will enchant your guests, build anticipation for your event, and most of all, put a smile on the faces of your friends and family members. At Locust House Fine Stationery, we create enchanting invitations that build anticipation for life's most significant moments. Using only the finest materials, we'll work with you to create distinctive wedding invitations that will make your guests gasp with excitement when they open their mailboxes. Locust House strives to bring a fresh element to each project. Unexpected materials, attention to detail, and careful study help to bring life to every piece we create. Works of art in and of themselves, Locust House invitations elicit real and emotional reactions from each recipient. An excited inhalation of breath when they see your bespoke envelopes and wax seals; a gasp if excitement when they slide the invitation from the envelope; phone calls, texts, and emails full of compliments soon follow. 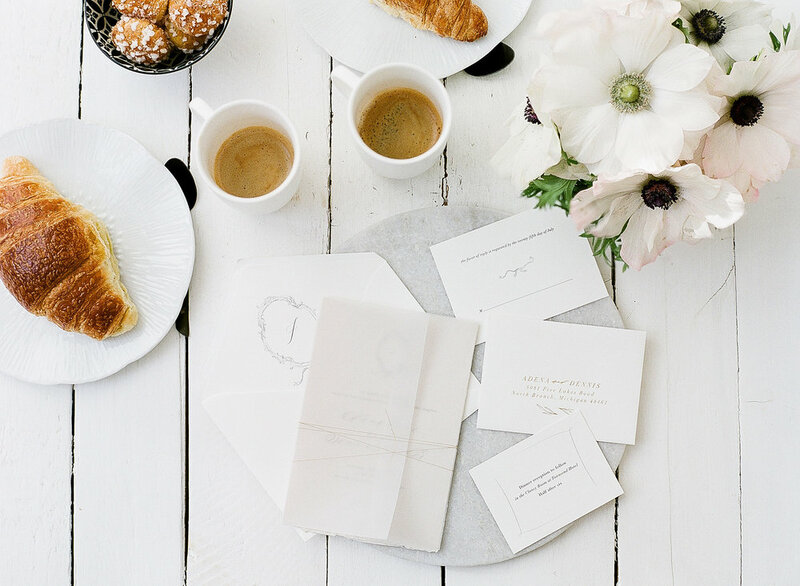 From artwork to design, from calligraphy to finishing touches, Kristy creates each piece with intention, using your event stationery to set the tone of your wedding from your guests' first look, through to your farewell brunch. Locust House accepts a limited number of invitation and editorial requests per year. For this reason, we recommend inquiring early. Sign up with your email address to receive your complimentary copy of our "Bespoke Stationery Information Guide"
Thank you! You can download your complimentary "Bespoke Stationery Information Guide" by clicking here. Kristy will be in touch with you within 72 hours on Monday - Friday. Please keep in mind that wedding invitations should be mailed 6-8 weeks prior to your wedding day. Knowing your estimated investment will help us determine the best materials for your invitation suite. Please tell us about your wedding stationery needs.